are located near the power-plant on the left bank. Hello again. I received an inquiry this week about our ability to model the near field structure of thermal plumes, generated by the discharge of warm waters from power plant cooling systems. Getting back on topic, FLOW-3D resolves the Navier Stokes equations including detailed free-surface dynamics, in 3D and with a number of advanced turbulence models available, and also fully couples density changes (via temperature changes, varying initial conditions, or changes in salinity, turbidity, etc). In addition, spatial scales of tens of kilometers upstream or downstream nowadays are very efficiently handled in high detail, no need to simplify anything down to 1D or 2D models, certainly not on the basis of computational time, that rational simply no longer exists. 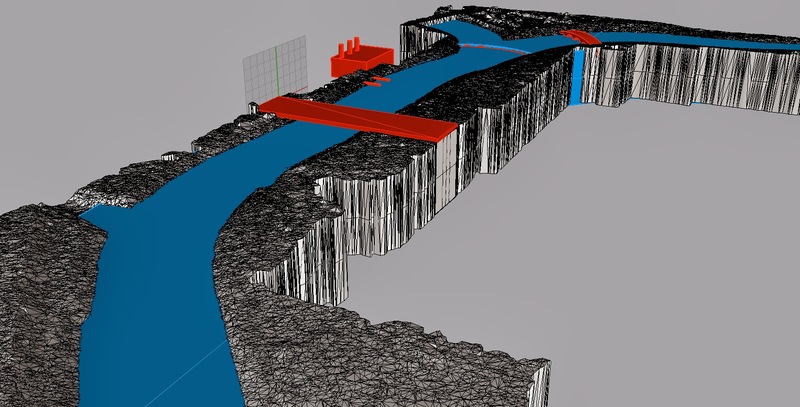 "Lay of Land" - Bathymetry and geospatial layout of the power-plant, ducts, bridges and weir. I might add that what I have witnessed (over and over from running similar simulations) is that these flows, in particular the thermal structures (or indeed upstream entrainment probability maps) are in fact highly three dimensional: the vertical structures and distributions of flow parameters are anything but uniform through the water column, and the detail of the bathymetry is very significant. My take home message here is to use a 3D solution in order to model these phenomena accurately. This said, even if the flow characteristics turn out to be complex, these types of simulations are actually quite straightforward to set up in FLOW-3D. In particular our free gridding approach to meshing fluid and solid quantities makes not only the setup, but also subsequent modifications in the parameter space (such as flow conditions or new geometric configurations) extremely efficient: whether it's the initial meshing of the problem, or subsequent iterations, the meshing operations are in all cases minimal. In this example the bathymetry represents a junction in the San Antonio River, and I added some detail (the power plant, the exhaust ducts, exhaust volume flow rates and densities), and turned on the additional physics that relate to thermal plumes (density evaluation, turbulence model, and mass sources), not much to it! Typically then we would look at the three dimensional temporal and spatial distributions of the fluid density or temperature (in this case I used density as a proxy), and then maybe would take some 2D plane cuts to get a sense of what regions are affected and when. 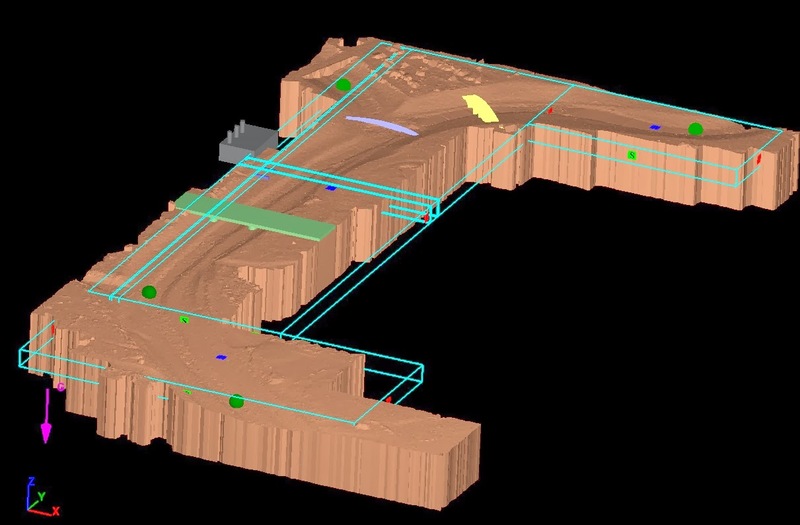 What I found really interesting is that FlowSight (FLOW-3D's next generation post-processor) allows you to color components (rather than fluids, i.e., the river bed itself) by fluid property on the contact surface. What this means is that we can very easily map the regions of the river bed which will be affected by the thermal plume. If you are looking at benthic communities, this is the way to do it! Here is an animation of the result of this simulation. If you click on the little full screen icon (bottom right of the video) you will get a better view of what is going on. The right hand side window is a view of the fluid with the exhaust's thermal signature, as is the top left window, the middle left is a 2D vertical plane cut just downstream of the bridge, and the lower left window is that view I mentioned, where we see the thermal signature on the river bed itself, as opposed to in the fluid. 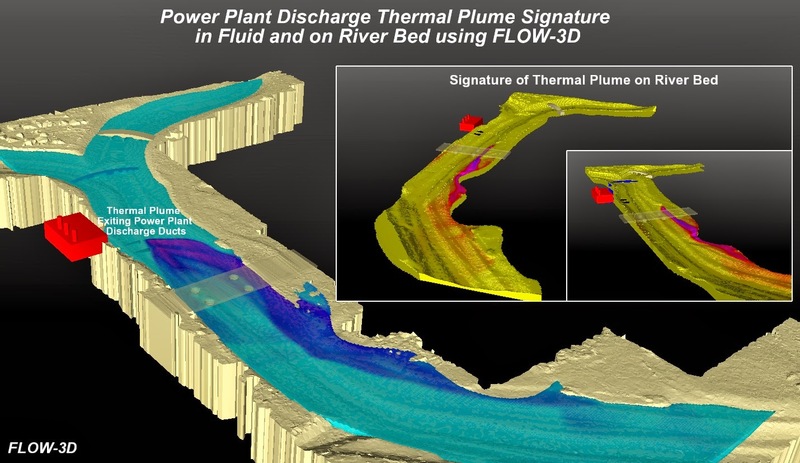 In conclusion, if mapping thermal plumes is your business, I would say FLOW-3D is a pretty phenomenal tool to conduct such studies, for its accuracy, robustness and speed, but also for the ease of use and simplicity in model setup, and of course the ease with which one can visualize and analyze results! Cheers all, until next time, any questions feel free to write directly.